View question - Pls Help! I Don't Know How To Do This! Pls Help! I Don't Know How To Do This! Let A, B, C be points on circle O such that AB is a diameter, and CO is perpendicular to AB. Let P be a point on OA, and let line CP intersect the circle again at Q. If OP = 20 and PQ = 7, find r^2, where r is the radius of the circle. 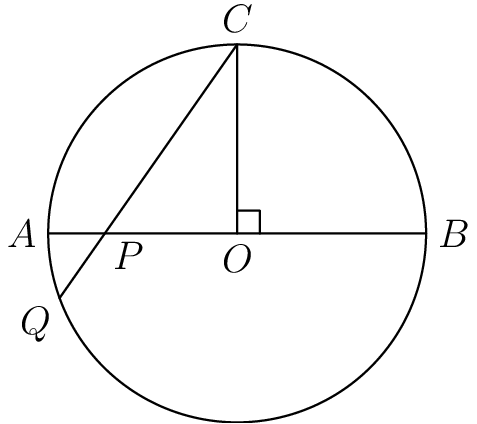 Let A, B, C be points on circle O such that AB is a diameter, and CO is perpendicular to AB. Let P be a point on OA, and let line CP intersect the circle again at Q. If OP = 20 and PQ = 7, find r^2, where r is the radius of the circle. How far have you gotten so far?